(CNN) -- Photographer David DeJonge plans to capture a vanishing bit of history Tuesday on a trip to Arlington National Cemetery near Washington. Antonio Pierro, 110, of Massachusetts served with the U.S. military in World War I and died in 2007. There, he hopes to photograph 107-year-old Frank Buckles, one of the few men still alive who fought in World War I. Buckles will lay a wreath at the grave of Gen. John J. "Black Jack" Pershing, who led U.S. forces in Europe in World War I. The visit comes 90 years to the day after the end of World War I, an occasion that led to Veterans Day in the United States and Armistice Day in other nations. For DeJonge, it's a poignant reminder that time is running out in his quest to find and photograph the few surviving veterans of the war, which raged from 1914 to 1918. "In my view, America has missed the boat in documenting this part of history," said DeJonge, a portrait photographer from Zeeland, Michigan. "It was such a pivotal moment in global history." He has raced the clock for the past two years to photograph the dwindling number of surviving World War I veterans, a mission he embraces with a keen appreciation for the ticking clock: Eight of 12 veterans he has photographed in the past two years are now dead. 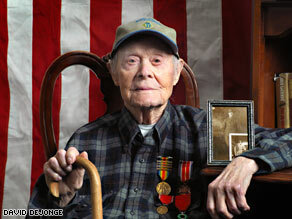 DeJonge knows of only 10 living veterans worldwide who fought during World War I. Four live in Britain, two in Australia, two in France and two in the United States: Buckles and 108-year-old John Babcock of Spokane, Washington, who served with Canadian forces during World War I, DeJonge said. Each week or month that passes, it seems, brings news of an aging veteran succumbing before DeJonge can find the time and money to photograph him. Not long ago, he said, two Jamaicans who fought with the British during World War I died. The last known German, French and Austro-Hungarian veterans died in the last year as well. "These are the last of the last," he said. DeJonge said he became interested in photographing war veterans in 1996, when he worked on a project to chronicle U.S. veterans of several wars. The subjects included two men who served during World War I. He tried to interest a photography organization in a national project to document the remaining U.S. World War I veterans -- about 600 were alive in the mid-1990s, DeJonge said -- but that didn't happen. So he set out two years ago to try to do it on his own. DeJonge has received some financial help here and there, he said, but has paid most costs himself. "I have paid about $100,000 of my own money," he said. He spends about half his time at home in Michigan, taking photographs to earn his living. He spends the other half conducting research, traveling to points distant or photographing aging vets. "I have an incredibly supportive wife," he said. He is trying to find money and time to take pictures of two vets in Australia and two in France, he said. And he would love to check out unconfirmed reports of an elderly man in the Ukraine who says he served with the Russian military during what also is known as the Great War and the War to End All Wars. In March, he donated nine portraits of World War I veterans that the Pentagon plans to display permanently. He traveled to Washington that month with Buckles, who drove an ambulance in Britain and France during the war as a corporal in the U.S. Army. In a White House ceremony in March, President Bush paid tribute to Buckles, who said he lied about his age and enlisted at age 15. "Mr. Buckles has a vivid recollection of historic times, and one way for me to honor the service of those who wore the uniform in the past and those who wear it today is to herald you, sir, and to thank you very much for your patriotism and your love for America," he said during the March ceremony. DeJonge and Buckles plan to drive Tuesday from Buckles' cattle farm in Charles Town, West Virginia, to Arlington National Cemetery near Washington. The photographer said he feels "just an unbelievable respect" for men and women who served their country. And he savors the living history lessons they provide. "It really is like stepping back in time," he said.